Background and objectives: In living kidney donation, transplant professionals consider the rights of a living kidney donor and recipient to keep their personal health information confidential and the need to disclose this information to the other for informed consent. In incompatible kidney exchange, personal health information from multiple living donors and recipients may affect decision making and outcomes. 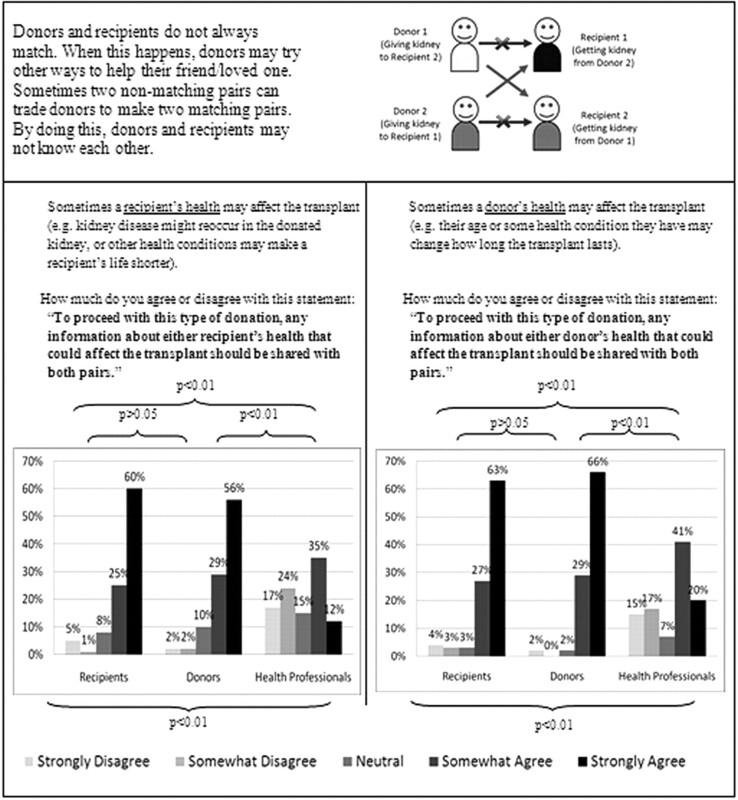 Design, setting, participants, & measurements: We conducted a survey to understand and compare the preferences of potential donors (n = 43), potential recipients (n = 73), and health professionals (n = 41) toward sharing personal health information (in total 157 individuals). Results: When considering traditional live-donor transplantation, donors and recipients generally agreed that a recipient's health information should be shared with the donor (86 and 80%, respectively) and that a donor's information should be shared with the recipient (97 and 89%, respectively). When considering incompatible kidney exchange, donors and recipients generally agreed that a recipient's information should be shared with all donors and recipients involved in the transplant (85 and 85%, respectively) and that a donor's information should also be shared with all involved (95 and 90%, respectively). These results were contrary to attitudes expressed by transplant professionals, who frequently disagreed about whether such information should be shared. Conclusions: Future policies and practice could facilitate greater sharing of personal health information in living kidney donation. This requires a consideration of which information is relevant, how to put it in context, and a plan to obtain consent from all concerned. Living kidney donation is a complex decision, with multiple medical, legal, and ethical facets. To proceed, transplant professionals discuss the risks and benefits with potential donors and recipients. Much of the information presented to potential living kidney donors and recipients is generic in nature (e.g., donor risk for perioperative death is 3/10,000 [1,2]); however, the transplant team may discover personal health information about a donor or a recipient that could affect expected outcomes. This information may be important to share so that informed decisions can be made about whether to proceed. Many regions have legislation that protects the confidentiality of personal health information (3–6); however, to satisfy the elements of informed consent, a person who is receiving treatment should also be provided with information that a reasonable person would want to know (7,8). For example, donors with mild controlled hypertension may be deemed eligible to donate by a transplant professional (9). Because the long-term medical outcomes for such donors are largely unknown (10,11), knowing this may alter a recipient's willingness to accept the gift. A potential recipient who is HIV positive may be reluctant to divulge this information to their donor or family, which could alter the donor's willingness to donate (12,13). In such situations, it is difficult to define which information is reasonable to share. To complicate the situation further, incompatible kidney exchanges have been introduced in many areas of the world, with national systems beginning in the United States in 2001 and Canada in 2009 (14,15). In this setting, multiple incompatible donor–recipient pairs are matched with each other to produce compatible matches, sometimes involving numerous pairs at multiple transplant centers, forming chains that can take months to complete (16). Donors and recipients are strangers to each other and may be more reluctant to share personal health information. These considerations prompted our examination of the preferences surrounding the sharing of personal health information in living kidney donation. There is no consensus on which information should be disclosed to all involved (17). In this study, we surveyed potential donors, potential recipients, and health professionals to understand better the attitudes toward sharing personal health information. This single-center, cross-sectional, observational study was performed in London, Ontario, Canada, in 2008 using a convenience sample of potential kidney recipients, donors, and health care professionals. The study was approved by our ethics review board. Recipients and donors came from the London Health Sciences Centre, which accommodates approximately 360 dialysis patients per year and performs approximately 80 to 90 kidney transplants per year, 25 of which are from living donors. Potential recipients were aged 18 to 70 years and indicated that they would consider accepting a kidney from a living donor. Potential recipients had to be medically eligible to receive a kidney transplant. Thus, those who could not have surgery under general anesthesia; lived in a long-term care facility; or had an active infection, stroke in the previous 6 months, or cancer in the previous 5 years were ineligible. All invited to participate were on chronic dialysis at the London Health Sciences Centre. Potential donors were between 18 and 70 years old, knew someone with kidney disease, and would consider living kidney donation. All invited to participate had formally contacted the local transplant center to inquire about becoming a living donor. Health care professionals included nephrologists, surgeons, living-donor coordinators, and clinical ethicists involved in living donation from transplant centers across Canada, the United States, and Australia. We recruited participants in person or by mail. A two-page letter of information approved by the research ethics board was presented to each participant, informing them that the survey was for research purposes and that participation was voluntary. We used Dillman's method for mailed surveys, whereby potential participants were telephoned then sent surveys in the mail with reminders after 2 weeks and 2 months (18). Surveys were self-administered and returned. Completion of the survey was considered evidence of consent to participate. A trained research assistant was available in person, by telephone, or by e-mail to answer questions about the survey. In traditional living kidney donation, we predicted that donors and recipients would be agreeable to sharing their personal health information. In incompatible exchange programs, we predicted that donors and recipients would be agreeable to sharing the donor's information but not the recipient's information. We designed the survey in consultation with nephrologists and epidemiologists who are involved in living kidney donation and pilot tested the survey on a small group of individuals who are involved in living kidney donation for clarity and understanding. Before the main four-question survey, demographic data and relationship information between potential donors and recipients were recorded, as well as an assessment of “curiosity” and “willingness to self-disclose” using validated scales to understand generic preferences toward knowing and disclosing information, respectively. The Social Curiosity Scale (19) assessed general and covert curiosity on the basis of a questionnaire that contained 10 items, on which participants indicated how much they agreed or disagreed with each statement on a four-point scale (1 = strongly disagree to 4 = strongly agree). The scale demonstrates high construct and convergent validity with other measures of curiosity (19). The Self-Disclosure Situations Survey (revised version) (20) consists of six items. Participants rated their willingness to reveal personal information in various situations on a six-point scale (1 = “I would be willing to discuss only certain topics and on a superficial level only” to 6 = “I would be willing to express in complete detail personal information about myself”). The scale demonstrates high reliability and validity and is accurate in determining a person's willingness to disclose personal information (20). After an explanation of incompatible kidney exchange, we assessed each participant's attitude toward information sharing in this setting. We asked participants to indicate their degree of agreement that to proceed, any information about either recipient's health that could affect the transplant should be shared with both donor–recipient pairs. A similar question was posed regarding information sharing about the health of either donor. All comparisons were analyzed for a significance level of P < 0.05. We used Fisher exact test to assess for baseline differences in categorical data among the three groups of participants (potential donors and recipients and transplant professionals). We used one-way ANOVA to assess for baseline differences between groups on the two scales of curiosity and willingness to self-disclose. We used a Kruskal-Wallis test to determine whether there was a difference between groups in their attitudes toward sharing information in each of the four situations. When a significant difference was detected, we used a Mann-Whitney U test for each pair-wise comparison. We also examined whether results differed by subgroups of recipient age, donor–recipient relationship, or whether the donor was a match, using Mann-Whitney U or Kruskal-Wallis test, as appropriate. We performed all analyses using SPSS 16.0 for Windows (Chicago, IL). We approached 437 individuals for participation in this study. Of those, 194 were eligible and given surveys, and 157 completed and returned the survey (73 potential recipients, 43 potential donors, and 41 transplant professionals). The response rate was 81% (96% of recipients, 76% of donors, and 66% of transplant professionals). Reasons for exclusion are outlined in Figure 1. Flow diagram of participation in the study. All potential recipients were on hemodialysis at the time of the survey for an average of 3.3 years. Of the 73 recipients, 14 (19%) had previously received a transplant, two of which were living kidney transplants. Potential recipients identified potential donors as grandparents (1%), parents (3%), children (8%), siblings (4%), spouses (4%), friends (1%), or others (1%) or did not have a specific donor in mind (78%). Of the 43 potential donors, 29 (67%) had begun the evaluation process, and of those, 19 had been told that they were a match. Potential donors described recipients as parents (12%), children (7%), siblings (23%), spouses (14%), friends (14%), and others (30%). Health care professionals included 17 (42%) nephrologists, five (12%) surgeons, nine (22%) transplant coordinators, and 10 (24%) clinical ethicists. All were familiar with or involved in the processes of living kidney donation. Characteristics of the study participants are described in Table 1. Recipients were more likely to be older, less likely to have a postsecondary education, and less likely to be married than donors and health professionals. Donors were more likely to be female. Social curiosity and willingness to self-disclose scores did not differ significantly between groups. 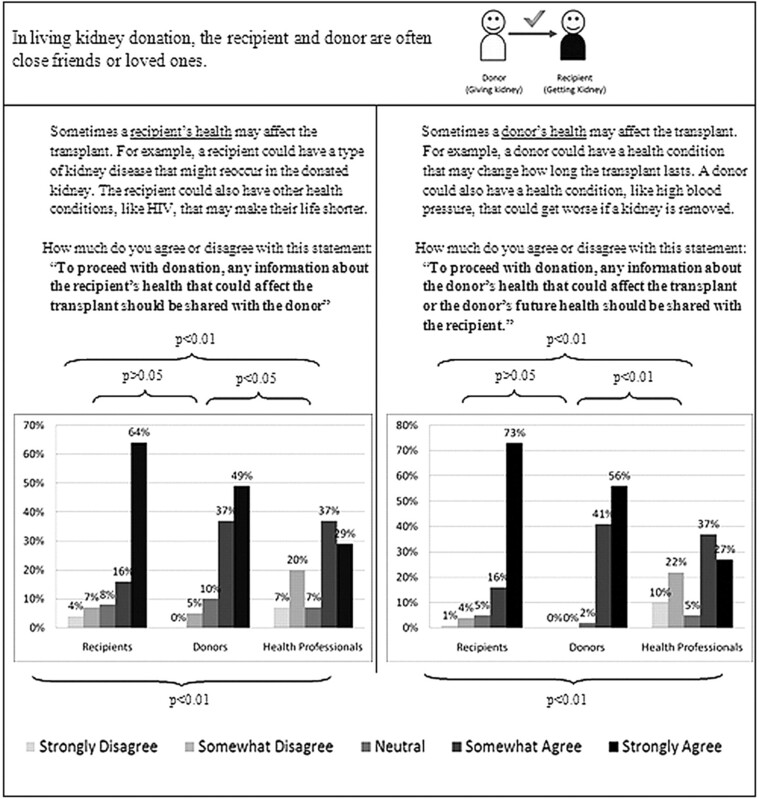 Potential donors and recipients were largely in favor of exchanging personal health information that could affect the transplant outcome (Figure 2). In traditional living donation, 89% of recipients wanted information about their donor's health, and 80% were agreeable toward sharing their own health information with their donor. Similarly, 86% of donors wanted information about their recipient's health, and 97% were agreeable toward sharing their own health with their recipient. Variability was higher among health professionals. Although most agreed that personal health information that could affect the transplant should be shared, 27 and 32% of health professionals disagreed that the information of the recipient and the donor should be shared, respectively. The Kruskal-Wallis test indicated that there were significant differences between the groups in both questions about traditional living kidney donation (P < 0.01). The Mann-Whitney U tests revealed that there were no significant differences in the responses of donors and recipients, but there were significant differences between donors and health professionals and between recipients and health professionals (in both cases, P < 0.05). Tradition living kidney donation: Survey questions and responses. Similar to traditional donation, most donors and recipients agreed that personal information should be shared when it could affect the outcome in incompatible kidney exchanges (Figure 3). A total 90% of recipients wanted information about both donors' health, and 85% were agreeable toward sharing their own health information with the other donor and recipient. Similarly, 85% of donors wanted information about both recipients' health, and 95% were agreeable toward sharing their own information with the other donor and recipient. Health professionals responded with more variability than that seen in traditional exchange. Only 61% were agreeable toward sharing donors' information across the exchange. The variability in responses was most evident in regard to sharing the recipients' information, with 47% in favor and 41% against sharing. The Kruskal-Wallis test indicated that there were significant differences between the groups in both questions about incompatible exchange (P < 0.01). The Mann-Whitney U test revealed that there were no significant differences between donors and recipients, but there were significant differences between donors and health professionals and between recipients and health professionals (in both cases, P < 0.01). Incompatible kidney exchange: Survey questions and responses. There were no significant differences among subgroups of donor age (≤54 versus ≥55 years), donor match status (match versus no match), or donor-recipient relationship (spouse versus related versus unrelated). 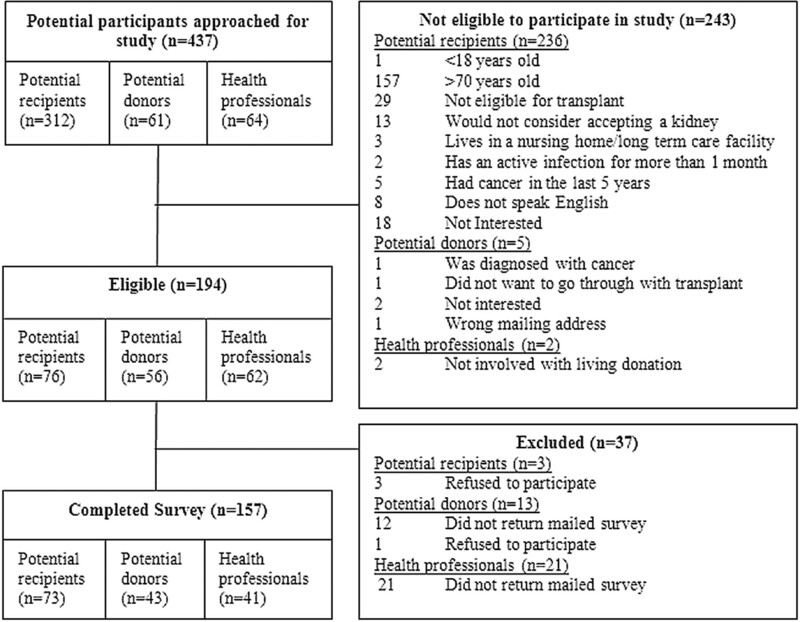 Most prospective donors and recipients support the sharing of personal health information in traditional living donation and incompatible kidney exchange when this information could affect the success of transplantation. Slight differences between donors and recipients may be attributable to the fact that all donors surveyed responded with a specific recipient or loved one in mind, whereas only 22% of recipients had a specific donor in mind. There was no consensus among transplant professionals on attitudes toward information sharing. Their conservative responses may have been influenced by their familiarity with the transplant process and greater understanding of the complexities of privacy and confidentiality. Sound practice for information sharing is a long-standing tradition in the field of solid-organ transplantation. Examining patient preferences in this area, however, is in its infancy. The current legal framework for living kidney donation strictly requires patient consent for the disclosure of any personal information (5,7,9). Our results do not advocate for complete information sharing but rather consideration for greater information sharing. The rights of any donor or recipient who is opposed to information sharing must be respected, but transplant teams should not assume to know how much patients value their confidentiality. In North America, despite the growing emphasis on patient autonomy, the decision to accept a living donor ultimately belongs to the transplant professional (21). Transplant professionals have the training necessary to identify the potential adverse effects of donation and estimate the success of a transplant. In truth, it is often very difficult for patients to integrate the health information provided. One such example includes differences in expected clinical outcomes when donors who are involved in an incompatible exchange are of notably different ages. If such information were shared, then the recipient of the older kidney may decide that the trade is unfair and request another arrangement. Physicians may be compelled by recent evidence suggesting that long-term graft survival of kidneys from donors may not differ significantly with age (22) and decide that sharing such information is not necessary to proceed with transplantation. Although general statistical information may meet the requirements for informed consent, our results suggest that donors and recipients are in favor of exchanging additional information. Transplant professionals should better facilitate the sharing of information within legal limitations, not only in accordance with the preferences of donors and recipients but also for ethical reasons. Physicians are obligated to share any information that a reasonable donor or recipient would want to know to proceed with transplantation, including information that could affect the recipient's outcome (23,24) or the donor's future health (7). In this regard, clinicians are best guided by ongoing transplant outcomes research. Failure to disclose such information could impede a patient's ability and right to make an informed, autonomous decision (25). Physicians are also charged with putting their patients' personal health information in context. For instance, suppose a potential donor has a history of a Centers for Disease Control and Prevention risk factor (e.g., homosexuality) but negative viral serologies. Disclosing viral serology status alone may be sufficient to help the patient make an informed decision about proceeding with transplantation while guarding against discrimination. In traditional donation, transplant professionals can inform donors and recipients that information sharing is appreciated by transplant candidates and encourage voluntary disclosure. Policies that protect those who do not wish to share certain information should remain in place; however, if a scenario arises in which a participant does not wish to share information that the transplant team believes is necessary to share, then the team should feel comfortable refusing to proceed until any issues surrounding information sharing are resolved. In incompatible kidney exchange, donors and recipients are generally unknown to each other. In this setting, transplant professionals use practices that are used in traditional living and deceased donations; although anonymity can be preserved, communicating a controlled amount of information remains necessary and complex. In such a scenario, all transplant professionals who are involved in the exchange should come to a consensus about which information should be disclosed. Unlike traditional donation, appropriate information transfer should take place between transplant teams, and each donor and recipient must consent to having this information disclosed to all parties. Should one party refuse to disclose what transplant professionals mutually agree to be relevant information and when general statistical information is insufficient, the team should also feel comfortable refusing to proceed until information sharing issues are resolved. Our study is the first to examine preferences for information sharing in the living kidney donation process and to offer empirical data to suggest that current practices, which emphasize protecting medical privacy, may need to be reexamined. In developing our survey, two validated measures of social curiosity and willingness to self-disclose were used to determine any baseline differences between groups. Our response rate was high at 81%. Limitations to the study include convenience sampling of a primarily white population at a single center in Canada. These factors may affect the generalizability of this study's findings, particularly to other cultures and religions in which patients may be more private about their personal health information. The results must also be interpreted in light of some potential sources of bias associated with the survey questions. As with any survey that involves hypothetical scenarios, potential donors and recipients may not respond as they would if faced with such circumstances in real life. It is also difficult to know how well each participant understood the survey concepts presented to them, particularly in regard to incompatible kidney exchange (a relatively new practice in Canada at the time of survey administration). To help all participants understand incompatible exchange, a detailed description of the process was given (Figure 3), and a trained research assistant was available in person or by telephone to answer any questions. It is also notable that all recipients were candidates for kidney transplants and all donors were engaged in the transplantation process and had been given previous information about transplantation by their health care team. These findings, along with additional scientific, ethical, and legal considerations, should guide future efforts in creating a framework for sharing health information in living kidney donation (26). This should include a consensus on the breadth of relevant information, practical methods for communicating the information, and a practical method to ensure that patients consent before the transfer of any information. Further research could examine whether the sharing of information should be mandated or merely encouraged, how peoples' attitudes toward information sharing may differ between minority groups, how to protect the rights of those who are unwilling to disclose information, and how changes in policy and practice may influence the decisions of donors and recipients. Such efforts are particularly timely given the increase in living kidney donation and incompatible kidney exchange (27). A.Y. is supported by a Canada Graduate Scholarship from the Canadian Institutes of Health Research and a Schulich Graduate Scholarship from the University of Western Ontario. A.X.G. is supported by a Clinician Scientist Award from the Canadian Institutes of Health Research. Donor Nephrectomy Outcome Research (DONOR) Network Investigators: Neil Boudville, Laurence Chan, Christine Dipchand, Mona Doshi, Liane Feldman, Amit X. Garg, Colin Geddes, Eric Gibney, John Gill, Martin Karpinski, Scott Klarenbach, Greg Knoll, Charmaine Lok, Mauricio Monroy-Cuadros, Norman Muirhead, Christopher Nguan, Chirag Parikh, Emilio Poggio, G.V. Ramesh Prasad, Leroy Storsley, Darin Treleavan, Robert Yang, and Ann Young. We thank Diane Smith, Jennifer Cross, Karen Peters, Kim Sargent, and Mike Berta from the London Health Sciences Centre.